The Lumia 610, 710, 800 and 900 were all set to launch in the Philippines, but the Windows Phones have had their entry into the country delayed due to supporting carriers. According to Electronic Pulp, all four Lumia devices will not be arriving anytime soon, which is a massive blow for both Nokia and Windows Phone with the Philippines being a rather important market to tackle. We previously covered the Nokia launch party of the Lumia 710 and 800, but it seems as though things have gone downhill for the manufacturer since, with no immediate plan to provide the 610 and 900 with the same treatment. The carrier Globe Telecom is set to stock the Lumia 800, while Smart Communications picked up the remaining three Windows Phones. Nokia has reportedly given up exclusive rights to sell the handsets in the Philippines. The Finnish manufacturer has an agreement with both Globe and Smart for only the carriers to market and sell the Lumia Windows Phone family of devices. This prevents the manufacturer from bringing in retail units and getting them into consumer hands in a speedy fashion, which has led to subsequent delays due to carrier demands regarding their own exclusive launches. The Lumia Windows Phones were originally scheduled for an early 2012 release in a number of countries. Thus far the rollout has been somewhat successful, but there appears to be a few cracks appearing in the Nokia walls. According to the Nokia employee that Electronic Pulp who was questioned regarding the delays, the Lumia 610 low-budget handset was planned to be out in the public domain during the first week of April, but the manufacturer has hit a wall with the carrier agreement and now can't provide an accurate ETA on launch dates for any device. The company is reportedly working hard at ironing out the creases and hopefully both Nokia and the two carriers will work things out quickly. 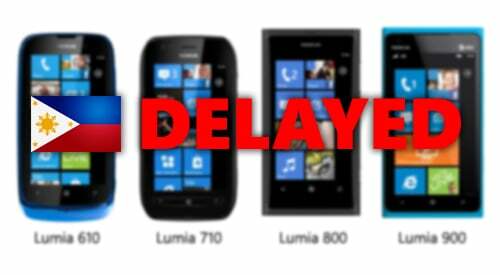 So, to recap (as it confused us slightly too): the Lumia 710 and 800 availability is delayed, and the launch of the Lumia 610 and 900 is also delayed, all due to the agreement made with local operators. Should you be patiently waiting for any of the Nokia Windows Phones on either Globe or Smart, you might have a few more weeks to see through.